(CNN) The average tweet from President Donald Trump elicits thousands of replies. But amid the diehard supporters and trolls is a friendly voice, just trying to look out for the leader of the free world. SNL writer Josh Patten has taken to casually replying to the President’s tweets like they’re personal texts, and the responses are absurdly chummy. So far, Patten has offered travel tips, Netflix recommendations and a typical “text if you need anything.” He gives a world leader the same kind of vaguely interested messages that you’d quickly send to appease your parents. Patten announced his endeavor in a tweet Sunday featuring screenshots of some of the highlights. Trump is getting ready to fly out to Europe for the G20 summit? “Call when you land,” Patten wrote in what appears to be his first text-message-style response. 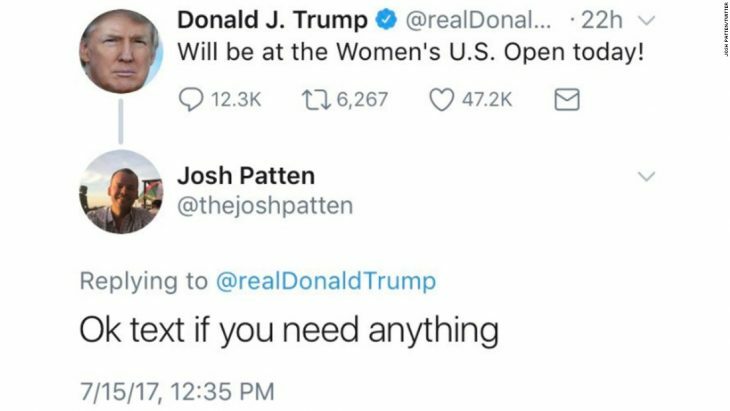 The President is at the U.S. Women’s Open? “Sounds neat keep me posted,” Patten quipped. We reached out to Patten — via Twitter, of course — but he declined to comment.